Last week I attended the This is Not a Wife Beater campaign launch at the ACT Legislative Assembly to represent Farrar Gesini Dunn, who is a major sponsor of the campaign. The launch featured a photo exhibition of ambassadors in campaign singlets, including rugby player Terry Campese, Coordinator-General for Domestic and Family Violence in the ACT Vicki Parker, and ABC journalist Virginia Haussegger. 666 ABC Canberra presenter Genevieve Jacobs was MC for the launch, which featured a range of speakers including Ngunawal Elder, Aunty Jannette Phillips, Andrew Leigh, Yvette Berry, 2015 ACT Young Australian of the Year Finalist, Kylie Travers, and campaign founder, Alisa Draskovic. This is Not a “Wife Beater” is a Canberra-based, not-for-profit campaign that challenges language, attitudes, stereotypes and behaviours that minimise and condone intimate partner and family violence. 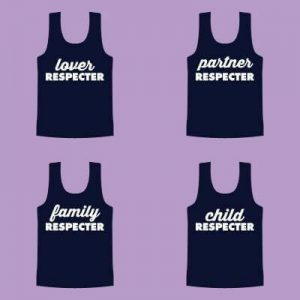 NAWB does this by reclaiming the singlets casually referred to as “wife beaters”, renaming them “respecters”, and using them as a symbol to promote respectful relationships, and safe and inclusive communities. The campaign encourages you to be a “respecter” by challenging you and the people around you – your friends, family, peers, colleagues, and fellow Canberrans – to do something. This starts with accepting responsibility for the way you think, talk and act, and taking action, such as calling out the minimisation of violence against women, to put an end to intimate partner and family violence. On average, one woman is killed every week in Australia by a current or former partner. 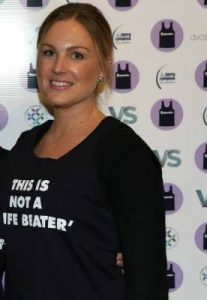 The seriousness of intimate partner and family violence cannot be overstated, and yet it is socially acceptable to refer to a navy or white singlet as a “wife beater”. A “wife beater” is a popular culture reference to the navy and white singlets associated with men who, because of their economic and/or social status, are assumed to be violent towards their partners and families. Failing to question why an item of clothing derives its name from violence against women is deeply disturbing and reflects how normalised joking about violence is, especially in relation to violence against women. Only occurs between people who are married or living together. Going forward, the campaign will be running smaller local events, as well as developing resources that highlight the detrimental effects of language that minimises and condones intimate partner and family violence, and the ways in which we can all play a role in challenging this and promoting respect and respectful relationships in our communities. Anyone wishing to get involved in the campaign, contact the campaign organisers on contact.nawb@gmail.com or visit their facebook page.